Officially, everything is rosy in the world of rotor blades. Whilst the manufacturers give the theme of rain erosion a wide berth, national and international organizations are looking into it closely, as are the coating manufacturers. On the one hand, tests have shown that the coatings have only a limited ability to withstand the extreme conditions. On the other hand, there is a lack of unified norms for coating test stands and for the requirements that the coating needs to fulfil. Although the exact causes of the problems are still unclear, the findings are rather unappetising. The ever larger rotor blades have led to increasing rotation speeds of the blade tips. Offshore, speeds of up to 90 m/s are now reached. This is around 330 km/h. At these speeds, raindrops and hailstones hit the coating like bullets and remove the erosion protection like a pressure washer. After that, the rain washes away the rest of the coating layers and in the worst case exposes the blade structure. The tips and the leading edges of the blades are most affected. Because the aerodynamics also get ruined along with the protective coating, the repair costs are accompanied by a loss in yield for the operator. Various studies estimate these losses to be between 4 and 10 %. If delamination sets in, this can quickly rise to 20 %. "The service life is significantly less than 10 years. It would already be an improvement if the erosion protection lasted six to seven years on the blade tips", says Stefan Brassel, blade expert at Deutsche Windtechnik Rotor und Turm GmbH. The damage can first be seen on land. Here, there are systems which, according to Brassel, work really well but nevertheless start to show damage after four years. A central reason for this is the environmental influences. In addition to rain, sand and hail, UV radiation and the mechanical stresses in the blade cause damage. Because the same coating systems and manufacturing techniques are used for offshore turbines, the same problems are inevitable. But in a completely different dimension because repairing blades at sea is more expensive per se and the number of turbines is high. Achieving solutions, however, is even more difficult. For current products with their limited durability the manufacturers coat the blades with weatherproof coating systems made from polyurethanes. And this is likely to remain so. "They are used because there is no suitable alternative coating and the systems are, in principle, very weather-stable, as they must be. But up to now the protective coatings have not stood up to the extreme conditions for very long. This is a problem faced by all manufacturers", explains Susanne Bender from the Institute for coatings in Magdeburg (Institut für Lacke und Farben, ILF). What has been missing in the coatings sector up until now is well-developed test procedures and test stands with which damage through rain erosion can be reproducibly simulated in the laboratory. Two of the possibilities are high-pressure water jets and "helicopter" test stands. One such helicopter test stand is owned by the chemical industry giant BASF. On this stand, coated GRP components rotate with a speed of 500 km/h and are pelted with raindrops. In contrast, the ILF in Magdeburg uses slowly rotating samples at which a high-pressure water jet is aimed. Both of these methods are said to provide quite an accurate simulation of the real conditions and produce fast results on the durability of the material. A further test stand will soon go into operation at the Fraunhofer Institute for Wind Energy and Energy System Technology (IWES) in Bremerhaven. Their helicopter test stand provides some new superlatives for the coating sector. The size of the raindrops can be selected, as can the temperature using a full air conditioning system. Even the salt level can be adjusted in order to test the abrasive effects under different conditions. Although there are other possibilities for testing in the USA and in England, the coating manufacturers usually make their way to PolyTech A/S. The Danish specialists offer what is so far the only rain erosion test stand approved by the industry. There, classical erosion protection products have so far only lasted for a maximum of two hours. A product from BASF performed better. Their newly developed leading edge protection survived the rain shower at 150 m/s for 18 hours. The durability of the product has thus increased in comparison with its predecessor by a factor of four. 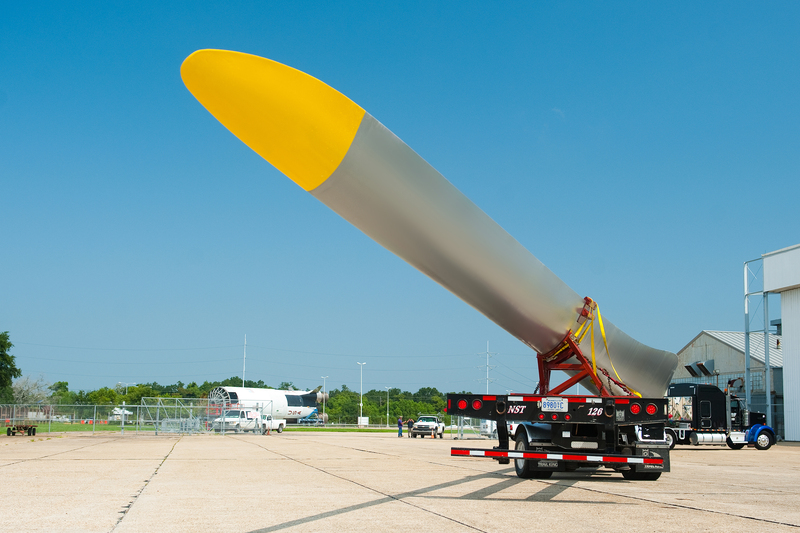 The blade manufacturer LM Wind Power is also heading in this direction and has developed ProBlade, a new leading edge protection that is said to have been improved by a factor of five.